Beautiful Long Beach, California was the setting for IANA’s (Intermodal Association of North America) annual expo, the IANA Intermodal Expo 2018. Over 2,000 representatives from the intermodal and transportation communities touched down to present, converse, debate and exchange ideas surrounding trends and issues shaping the future of the larger intermodal supply chain community. We had the pleasure of exhibiting and attending with those 2,000 plus attendees, and this year’s expo was chalk full of over 60 industry experts and a staggering 125 plus exhibitors showcasing some of the most technologically advanced products and services the intermodal industry has seen. The morning of Day 1 kicked off with Bill Strauss, senior economist and adviser with the Federal Reserve Bank of Chicago. Mr. Strauss managed to bring an initial, collective smile to the room, noting that the 2018 expo is meeting at a time of strong economic growth. Consumer spending and GDP are up, the economy has been growing at an average annual rate of 2.3 percent (since 2009), and if this continues through July of next year new records will likely be reached. 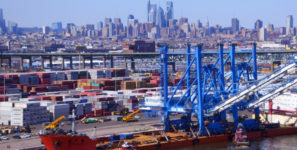 The intermodal industry numbers support Mr. Strauss, as intermodal volumes were up 7 percent (as of August 2018) compared to last year with the third-party logistics sector also expanding – global estimates peg the market to reach $968 billion this year, compared to $869 billion last year. IANA is a “connecting force” for the intermodal freight sector, bringing together the most relevant (and up and coming) players via the creation of spaces, such as the Intermodal Expo, to stay informed, drive industry success and strengthen the broader community. IANA members count on a wealth of resources, but most important, access to relevant trends that are shaping the sector at breakneck speeds. A handful of truly remarkable innovations were on-hand at this year’s expo. A recurring issue year in and year out is terminal overload. 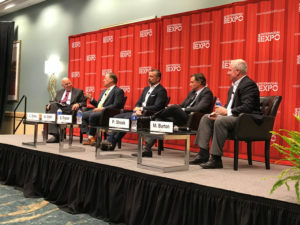 Moderated by Taso Zografos, Principal at ZDEVCO, the panel, “Intermodal Terminal Overload: How Can Technology Help?” brought together a handful of expert panelists on the issue where autonomous vehicles, automated stacking cranes and similar “smart equipment” was presented. Warehouses, marine terminals and rail ramps are fantastic for “smart equipment” due to little vehicle traffic and confined areas. The next challenge however will be rolling this out to harbor drayage and the open road. As Wade Long, regional vice president of Volvo Trucks astutely noted, heavy-duty diesel trucks, many operated by living, breathing drivers, will still be around for at least the next 50 years. Another recurring theme throughout the two-day event was productivity, especially in a time of truck driver shortages. This has been a troubling point for some time, where a shortage of drivers produces bottlenecks throughout the supply chain thus hampering productivity at a macro level. Larry Gross, president of Gross Transportation Consulting, moderated an engaging panel surrounding this very issue. Driver productivity has been on the decline, and Phil Shook, director of intermodal for C.H. Robinson, communicated it best noting that the industry standard used to be 500 miles per driver, and that has now dipped into the 400s. The room agreed that getting an extra half-a-load per driver per day is the proverbial Holy Grail. Next year’s expo will be held September 15-17, 2019 in that same jewel beside the bay – Long Beach, California. Pack your swim-trunks, this is an expo you don’t want to miss! Register to exhibit before space fills up or if you are just looking to attend, registration opens up in March of 2019.